So back to my tale of plein air painting in Corning Iowa. I am about to attempt a third painting in the same day. Not only that, look at the size of my canvas. What a brave lad. So here's another don't to add to our list. Don't ever paint in the sun, sitting down, wearing shorts. Why? Because when you sit down the shorts inch up your leg. Now remember, I am coming out of an art coma and my titanium white legs are not used to being exposed to direct sunlight..... I know what you are thinking, where is the sunblock that, she who must not be named, kindly told me to bring along? It's stuffed in my art bag. I was too excited about starting this painting, I forgot to put on the sunblock. ( if you are counting, I believe that this is mistake number 3 for the day) . My canvas is appropriately toned with a blazing hot orange. The sun was was cooking my left knee and turning it the same color as the car. At this point, I remembered the sun block, and got up to coat myself. So I stood, took off my glasses, and proceeded to coat my face, arms and legs in white oily goo. By the time I got this far with the painting, I was having so much fun. I was on a roll, but so were the insects. Another helpful hint... people aren't the only ones who like to watch you paint.... 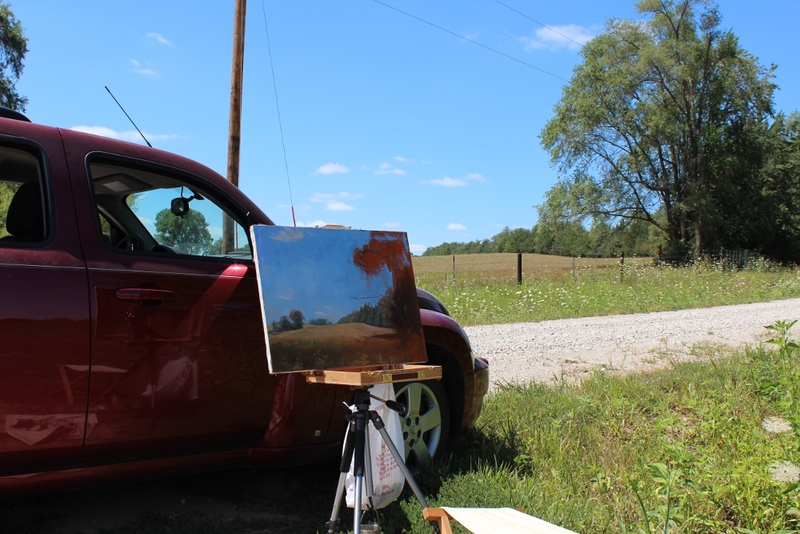 I find insects also have a strange appreciation for plein air painting. (I mean an attraction for plein air painters). So now, I had to get up again and coat my sun blocked skin with bug spray. I thought things were going well, especially when a nice breeze blew across the field to cool me down, and possibly chase the bugs away.... If only my day ended there. 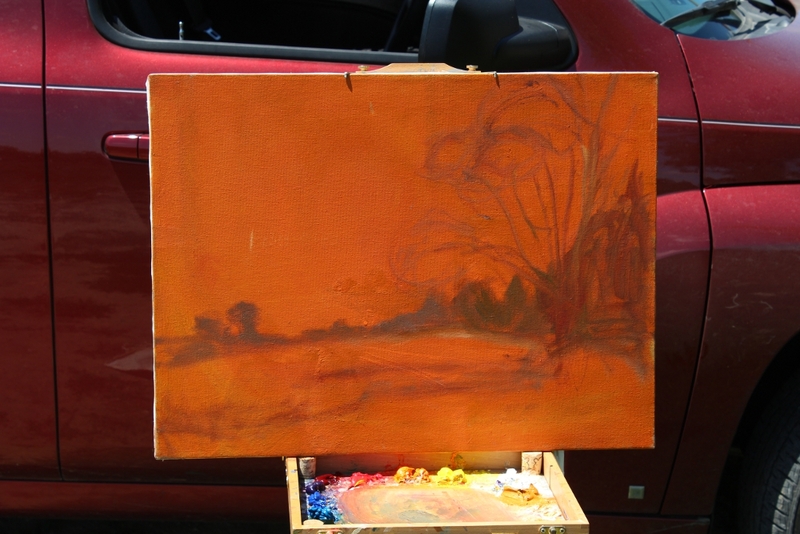 I took this progress photo and put the painting back on the easel and sat down for the final touches of paint. No sooner did I sit down and load up my brush when the gentle breeze turned into a strong headwind that lifted the painting off the easel .. I caught it with my shoulder. Lets just say the tree didn't look the same any more. I never swear but that day I came close. I decided on one more look in the back of the car... nothing. I closed the hatch and there perched on top of the roof of the car. Glasses. and so ended my first day back . You have so very beautifully described the joys and woes of painting outside. After many years of struggle, often with canvases bigger than I am, I now spend most of my painting time in my heat regulated studio listening to beautiful music or books on tape as I calmly paint whatever I have carefully designed on my computer looking at it on my ipad. The only thing that disturbs my equilibrium there is when I paint with quick drying white by mistake. Every once in while I venture out into nature to glory in her magnificence and try to capture a piece of it in paint. Still exhilarating but what a struggle!!! You are very funny and should consider writing a book! 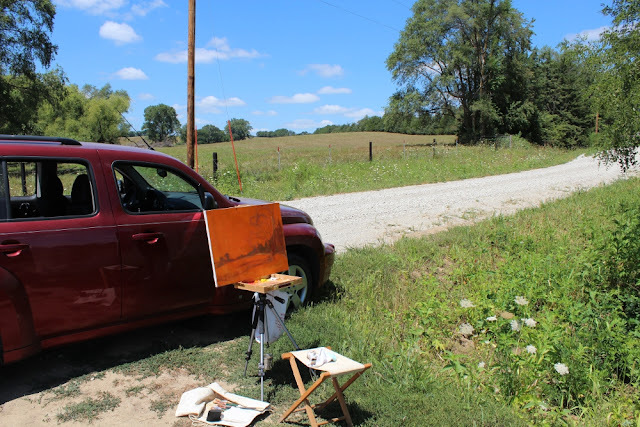 Even with all the troubles, your plein-air paintings are beautiful. 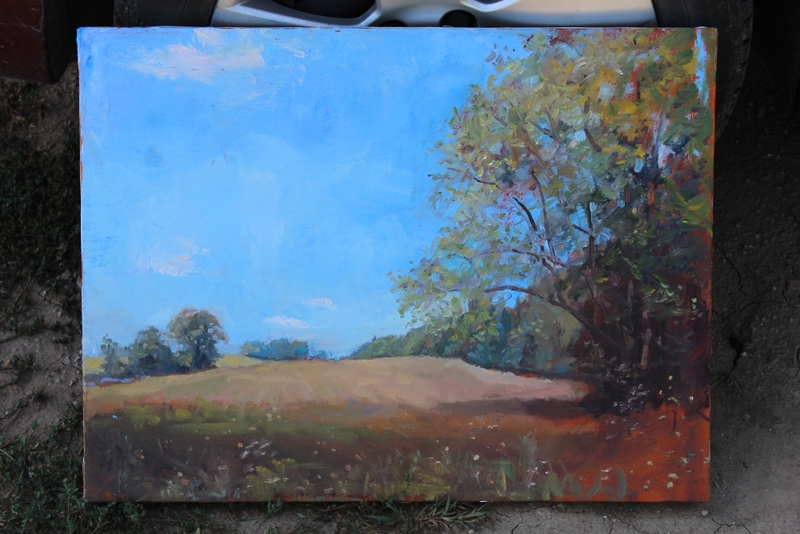 Obviously painting outside agrees with you, otherwise, why do it?